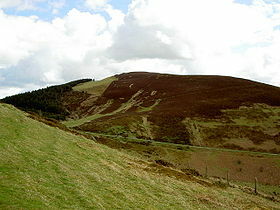 Starting from Loggerheads Country Park in Denbighshire, this walk climbs to Foel Fenlli. From here, the route follows the Offa's Dyke National Trail along the main ridge of the Clwydian Hills to Moel Famau from where a gentle descent is made back to the start. The walk offers superb views from the main ridge as far afield as Snowdonia. This is a full day’s walk - approximately 10 miles with around 509 metres of ascent. Please let me know if you plan to join this walk.